Use 3D Touch to create quick actions for your home screen icon. iPhone 6s / 6s Plus or newer, running iOS 9 or newer. Want to dive in quickly? Check out the demo app! Otherwise, continue reading. Check whether or not the device is capable. Android devices will also report false, so you can use this cross platform. When your app is running you can add those fancy Quick Actions to the Home Screen icon. You can configure up to four icons and they are 'cached' by iOS until you pass in a new set of icons. So you don't need to do this every time your app loads, but it can't really hurt of course. The type param (see the code sample below) is the most convenient way to relate the icon to the event you'll receive when the action was used to launch your app. So make sure it's unique amongst your icons. There are two types of icons currently supported: iconType and iconTemplate. A value from a fixed list of icons which have been provided by Apple and look great (click the value in the 'API' column to look up the Objective-C name, and look at the sample below how to use them). Can be used to provide your own icon. It must be a valid name of an icon template in your Assets catalog. 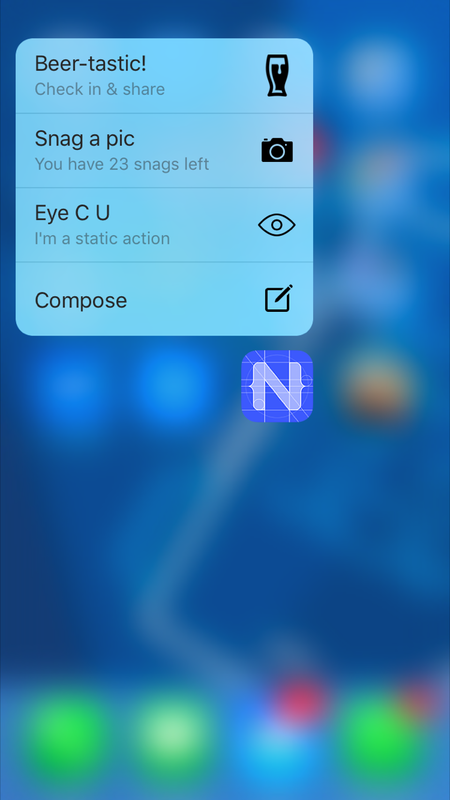 NativeScript allows you to add the icon to the app/App_Resources/<platform> folder. If you add a file called beer.png then reference it as beer. More on these images below when we discuss static actions. Ignored on iOS, if iconType is set as well. When a home icon is pressed, your app launches. 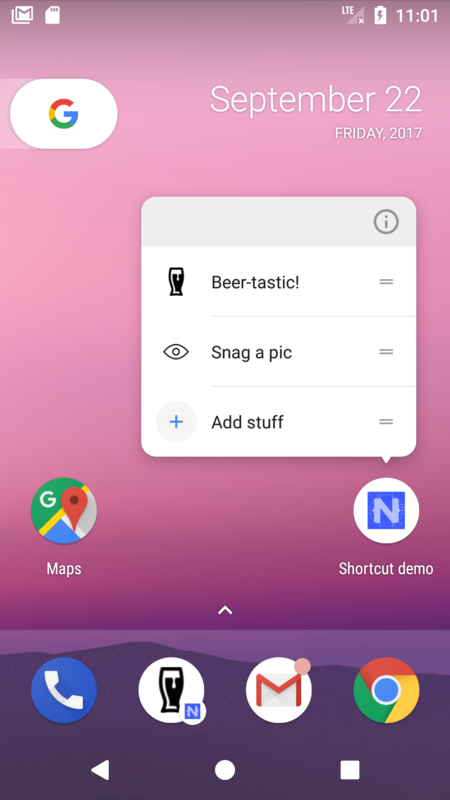 You probably want to perform different actions based on the home icon action that was picked (like routing to a different page), so you need a way to capture the event. With configureQuickActions you can configure dynamic actions, but what if you want actions to be available immediately after the app as installed from the store? You need to manually edit the .plist. Fortunately NativeScript allows you to change this file through app/App_Resources/iOS/Info.plist. Anything added there is added to the final .plist during a build. Note that dynamic actions will never replace static actions, so if you have two static actions you can add up to two dynamic ones. Any more will be ignored. The second action above uses the built-in UIApplicationShortcutIconTypeCompose icon, but the first one uses a custom icon: Eye. This expects the file app/App_Resources/iOS/Eye.png. According to Apple's docs this needs to be a single color, transparent, square, 35x35 icon - but that size will look pixelated on retina devices so go ahead and use a 70x70 or 105x105 icon if you please. You can guess what those do, right? Only the title is mandatory. This is the same as the type param of configureQuickActions, so it's what you'll receive in the callback you may have configured in app.js / app.ts as payload.type. Just do something cool with that info (like routing to a specific page and loading some content). This adds 1 static shortcut to your app (you can add more if you like). Make sure the action has the shortcut.type. prefix. The value behind the prefix is the equivalent of the iOS UIApplicationShortcutItemType. The targetPackage needs to be your app id. The targetClass needs to be the activity class as mentioned in AndroidManifest.xml, which is com.tns.NativeScriptApplication by default.